Trail Blazers head coach Terry Stotts described the injury as “devastating” and said Nurkic had been taken to a Portland hospital. 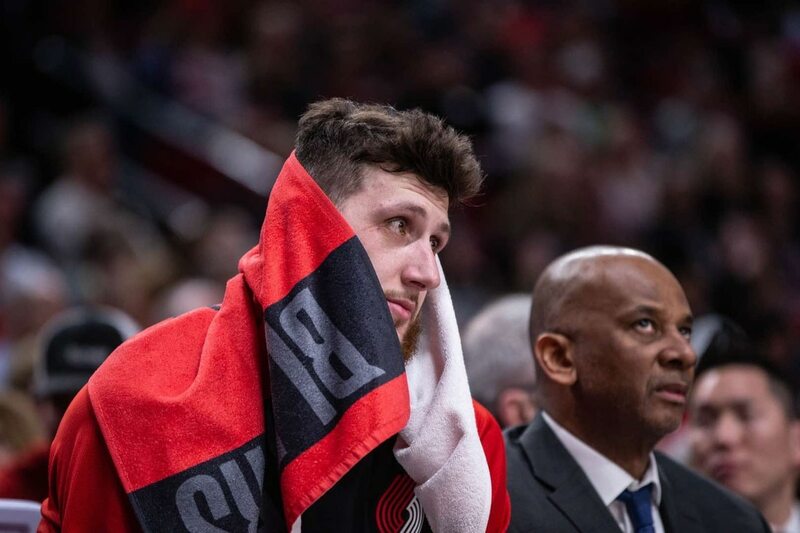 Portland Trail Blazers center Jusuf Nurkic suffered a horrific leg injury in the second overtime of a playoff-clinching victory Monday night. Trail Blazers head coach Terry Stotts described the injury as "devastating" and said Nurkic had been taken to a Portland hospital. "I don't know what to say," backup center Enes Kanter told team reporter Casey Holdahl, "but tonight I'm just going to go home and pray for him." The injury is the latest in a string of late-season leg injuries that Blazers fans can recite like an incantation—Greg Oden, Brandon Roy, Wesley Matthews—but the timing of this one was absurdly bleak. The Blazers clinched a playoff berth minutes after the injury, they have thrived while waiting for CJ McCollum's knee to heal, and they appeared poised to redeem last season's playoff embarrassment. The injury took place in the second overtime of a game attended by local children whose tickets were bought with donations. The first sign of the injury's severity was players turning away from the sight. Stotts looked like he was about to vomit. McCollum, dressed in street clothes, came off the bench to place a towel on Nurkic's forehead. All-Star point guard Damian Lillard held onto the side of the medical cart as his teammate was wheeled off the court. "That's my little big brother," Lillard told Holdahl. "The other day after practice, Nurk just came after practice to see my son, no reason at all. You at home, he wanna come by and see the baby. I think that says what our relationship is, came to a one-year old's birthday party."